( Leviticus 21:15-16, 21-22 KJV ) “Neither shall he profane HIS seed among HIS people: for I the LORD do sanctify him. And the LORD Spake unto Moses, saying, No man that hath a blemish of the seed of Aaron the priest shall come nigh to offer the offerings of the LORD made by fire: he hath a blemish; he shall not come nigh to offer the bread of his GOD. He shall eat the bread of his GOD, both of the most Holy, and of the Holy. “!! There is ONE TRUE GOD the FATHER!! 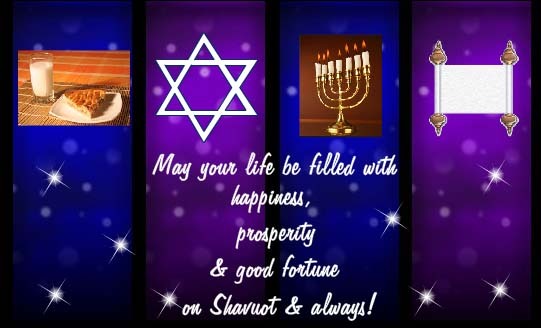 Shavu’ot, the Festival of Weeks, is the second of the three major festivals with both historical and agricultural significance (the other two are Passover and Sukkot). Agriculturally, it commemorates the time when the first fruits were harvested and brought to the Temple, and is known as Hag ha-Bikkurim (the Festival of the First Fruits). Historically, it celebrates the giving of the Torah at Mount Sinai, and is also known as Hag Matan Torateinu (the Festival of the Giving of Our Torah). Work is not permitted during Shavu’ot. It is customary to stay up the entire first night of Shavu’ot and study Torah, then pray as early as possible in the morning. It is customary to eat a dairy meal at least once during Shavu’ot. There are varying opinions as to why this is done. Some say it is a reminder of the promise regarding the land of Israel, a land flowing with “milk and honey.” According to another view, it is because our ancestors had just received the Torah (and the dietary laws therein), and did not have both meat and dairy dishes available. See Separation of Meat and Dairy. SHALOM O’ Ye ISRAELI’S and ISRAELI AMERICANS and CHRISTIANS!! Baruch HaShem -Yahweh –YHWH Jehovah Yeshua-Jesus Bless Ye All who STAND with Israel-Yisrael and our Judeo-Christian Nation USA!! ( Philippians 2:10-11 KJV ) “That at the Name of Jesus Christ-MESSIAH – Yeshua HaMashiach-MESSIAH every knee should bow, of things in heaven, and things in earth, and things under the earth; And that every tongue should confess that Jesus Christ is Lord, to the Glory of GOD the FATHER.”!! « US: Palestinian unity government not backed by Hamas?